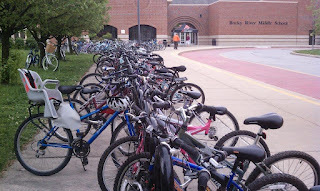 Century Cycles Blog: Rocky River Bike To School: 12,240 miles biked! Rocky River Middle School on May 7, the first day of the challenge. Biked 12,240 miles on their bikes, up 32% from last year's total miles. Took 3,825 bike-rides to school (average round-trip commute: 3.2 miles). 273 Rocky River Middle School students biked each day of the challenge on average, or 44% of the school’s enrollment of 620 students. This was up significantly from last year’s average of 191 bicyclists per day. The highest ride day May 11, when 344 students (56% of the school) bicycled. Saved an estimated 13,464 pounds of heat-trapping carbon dioxide emissions from the environment. Saved their parents $2,047.50 on gasoline, based on the current Ohio average gas price of $3.75/gallon. Burned an estimated 208,080 calories just bicycling to and from school. Rocky River Bike To School Challenge began last year. Rocky River students have biked a total of 21,523 miles and saved an estimated 23,675 pounds of CO2 emissions during the program’s two years. 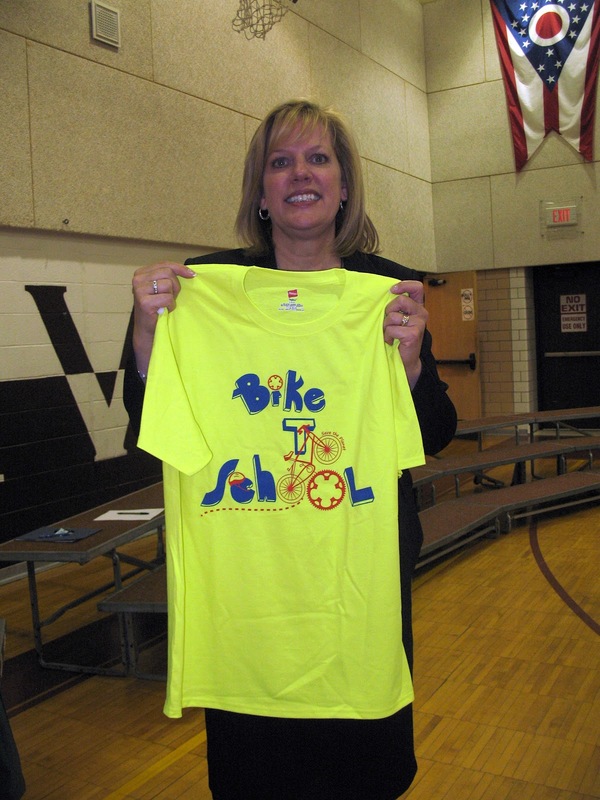 Mayor Pam Bobst poses with her Rocky River Bike To School Challenge t-shirt. 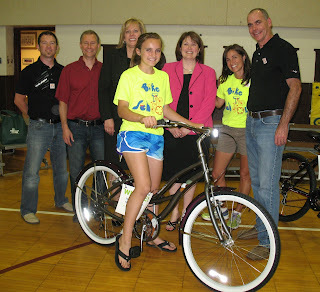 Main sponsors Century Cycles bicycle store in Rocky River and bicycle manufacturer Raleigh Bicycles teamed up to give away grand prize bicycles to 6th grader Hanna Chapman and 7th grader Laura Banks (pictured below). Laura Banks with her new Raleigh bicycle, presented by (l to r) Sean Burkey/Raleigh Bicyles, Scott Cowan/Century Cycles, Mayor Pam Bobst, Principal Megan Rose, BTS organizer/teacher Wendy Crites, and Chris Speyer/Raleigh Bicycles. Hanna Chapman was absent from the assembly. Raleigh Bicycles gave Rocky River Middle School a $500 award for exceeding its bicycling goals during the challenge, to use for fitness and bicycling programs. The company also honored middle school health and fitness teacher Wendy Crites (pictured below) with a new Raleigh Capri road bike for her ongoing commitment to youth bicycling and her leadership of the Bike To School Challenge program in Rocky River. Wendy Crites, second from right, is presented with a new Raleigh Capri road bike from Raleigh Bicycles. The Rocky River Bike To School Challenge t-shirt design contest was won by 8th grade student Clara Sandu for the second year in a row. She won a prize package from Century Cycles, and her winning design is featured on the front of the shirt given by Century Cycles to every student who biked to school four days during the challenge. Century Cycles owner Scott Cowan presents t-shirt design winner Clara Sandu with her prize. Other sponsors who contributed prizes and support to make the program possible were Honey Hut Ice Cream, Subway of Rocky River, Rocky River PTA, SportsTime Ohio and Starbucks. For more information about Bike To School Challenge and to see photos and videos, go to www.centurycycles.com/to/BTS or follow the program at www.facebook.com/BikeToSchoolChallenge.